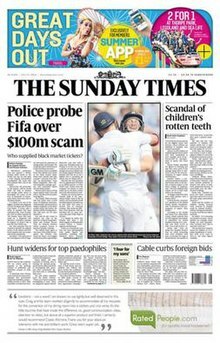 The Sunday Times has acquired a reputation for the strength of its investigative reporting – much of it by its Insight team – and also for its wide-ranging foreign coverage. It has a number of popular writers, columnists and commentators including Jeremy Clarkson and Bryan Appleyard. A. A. Gill was a prominent columnist for many years. It was Britain's first multi-section newspaper and remains substantially larger than its rivals. A typical edition contains the equivalent of 450 to 500 tabloid pages. Besides the main news section, it has standalone News Review, Business, Sport, Money and Appointments sections – all broadsheet. There are three magazines (The Sunday Times Magazine, Culture, and Style) and two tabloid supplements (Travel and Home). It has a website and separate digital editions configured for both the iOS operating system for the Apple iPad and the Android operating system for such devices as the Google Nexus, all of which offer video clips, extra features and multimedia and other material not found in the printed version of the newspaper. ^ Ball, Philip (2 October 2006). "When it's time to speak out". News@nature. doi:10.1038/news061002-12. ISSN 1744-7933. ^ Blake, Jonathan Calvert and Heidi (1 June 2014). "Plot to buy the World Cup". The Sunday Times. ISSN 0956-1382. Retrieved 7 February 2019. ^ Times, The Sunday (1 June 2014). "Plot to buy the World Cup: reaction from around the world to the Fifa files". The Sunday Times. ISSN 0956-1382. Retrieved 7 February 2019. ^ Jackson, Jasper (26 February 2015). "Fifa Files exposé by Sunday Times joint winner of Paul Foot Award 2014". The Guardian. ISSN 0261-3077. Retrieved 7 February 2019. ^ The Ugly Game. 27 June 2017. ISBN 9781501132964.